Dental Implants along with mini implants have changed the world of dentistry. Full implant placement is as involved as removing a tooth under local or sedation anesthesia. The development of long term dental implants now allows the oral surgeon to place anchors in the jaw during one or two treatment visits. The most common use for dental implants is the stabilization of dentures and overdentures. Implants firmly anchor the dental prosthesis, which means there is no longer any need to suffer with ill-fitting, loose dentures, or replace the missing tooth in the dental arch. Implants come in all different sizes and lengths so that they can be easily placed in most dental arches. Todays Implants are designed to eliminate bone grafting and expedite treatment for most of the cases. Some cases will require minimal to significant bone grafting and a recovery period. The latent period allowes the anchor of the implant to properly embed itself into the jawbone. After placement of the implants we let the bone integrate with the titanium implant for few months and then the implants are ready to be used for crown placement or for securing the dentures in a more stable fashion. What is the configuration of Dental Implants? 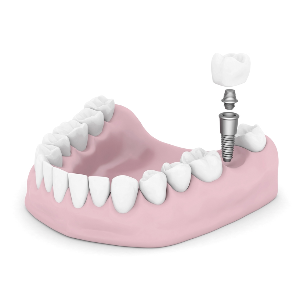 Dental implants (similar to a screw) that is designed to act in place of a natural tooth root. Implants are generally constructed from titanium and are either sprayed with calcium phosphate, or contain it along the length of the screw portion. The design and structure of implants promotes quick healing and long lasting results. The head portion of the implant locks in with many prosthesis, for example a ball. This ball fits firmly into the retaining mechanism and together these structures hold the dentures at a designated level. The dentures sit comfortably on the gum tissue and are able to withstand significant amounts of pressure and natural force. What are the advantages of Implant placement? Implants are a true innovation for people who are reluctant to have invasive dental surgery and for denture wearers. One significant advantage implants have is that they offer a viable treatment choice for patients who have experienced extensive bone loss. Depending on the quality and density of jawbone available at the implant site, four of these implants may be implanted at one time. Iimplants don’t require invasive surgery, which makes them a gentler option. Implants are being offered at a special introductory price, at this new practice. Please call for the details. The most common use for implants is to stabilize a lower denture, however they can be placed anywhere in the mouth, depending on the availability of bone’s height and width. The whole dental implant placement procedure takes approximately one hour. Generally, in the case of lower jaw implants, two to four implants will be placed to give stability to the dentures or to the missing teeth. Prior to inserting Implants, Dr. Khan will use many diagnostic and planning tools to find the optimal place to implant them. A small hole is drilled in the jawbone to situate each Implant. Finally, a ratchet wrench is used to fully stabilize the implants. The denture is measured against the implants and marks are made to indicate where the implants will fit. The denture is sent to the laboratory to have holes drilled to accommodate the implants and bar placement. Once the denture has been fully modified, it can be affixed to the implants. The rubber O-ring on each implant snaps into the designated spot on the denture, and the denture then rests snugly on the gum tissue. implants hold the denture comfortably in a tight-fitting way for a lifetime. In almost all cases, minimal stitching is required and no real discomfort is felt after the procedure. After the denture placement procedure is complete, light eating can be resumed. The denture can be removed and cleaned at will. Implants enhance the natural beauty of the smile and restore full functionality to the teeth. If you have any questions or concerns about dental implants, please ask your oral surgeon Dr. Khan.